Today, mobile payments. Actually, digital wallets. This annotation is important because the analysis’ centers around VR Bank HessenLand und Volksbank Mittelhessen introducing their pilot for smartphone-based mobile payment. Due to a payment-commoditization (payment goes from product to feature, see also PayPal and Raisin: payment-commoditization and FinTech-platforms), there is general agreement that mobile payment is to be integrated into another product. Candidates are banking apps, shopping apps, payment apps, and digital wallet. I am pro-digital wallets as they are inherently useful (they are better than analog wallets which are already – very effectively – used for mobile payment), combine the other products’ features and can create better solutions than those (e. g. contain new “things” such as virtual keys or to purchase new things such as parking tickets). Also, I argued that banks’ mobile payment solutions (exclusive for their payment methods) might make sense to them (by shutting out other payment providers they are prioritizing theirs) but not to the customer. As they give customers only a narrow choice of payment methods they turn customers’ payment behavior from paying with a wallet (with multiple payment methods) into paying with payment cards from one specific bank. Additionally, what speaks against such closed systems is that banks, by putting debit/credit cards on the smartphone, are not creating better solutions because smartphones are “fragile” (battery life, broken screens…) in contrast to NFC-based debit/credit cards. Last year (on 12 December — yes that “last year joke” is still valid) VR Bank HessenLand und Volksbank Mittelhessen started their pilot for smartphone-based mobile payment. It works based on NFC and they implemented the functionality as part of their banking app. To pay, the user must only put the smartphone to the terminal (opening the banking app is not required) . Noteworthy is that they implemented this solution as part of their banking app. This is noteworthy because mobile payment is a difficult undertaking when implemented as a stand-alone product instead of a feature. PayPal has diversified into other areas beyond payment. One of these areas are vouchers and other discounts. For instance, they offer discounts on certain purchases made with PayPal. This product augmentation doesn’t come out of thin air. Rather it is a way to combat vertical payment apps such as Target who provide that very same features to their customers for their own products. For instance, Target’s shopping app contains several vouchers and coupons to be redeemed directly when paying with their app. By adding such features to their own payment solutions vertical payment apps are becoming more attractive to customers than PayPal and as a consequence are shutting PayPal out. By the same token mobile payment as a stand-alone product will become commoditized into another “primary product”. Company-specific and universal shopping apps: company-specific apps are used at their respective merchants and support mobile payment as one of their features. Examples include Netto or Edeka. Universal shopping apps enhance the shopping process in some way with mobile paying as a part of it. PAYBACK with its PAYBACK Pay is maybe the most prominent example. Banking apps: Banking apps are issued by banks and support mobile payment. Examples are the ones by Deutsche Bank, Postbank, and the VR Bank HessenLand und Volksbank Mittelhessen. Digital wallets: Digital wallets are virtual representations of their analogous counterparts. Examples include Apple Pay, the Vodafone Wallet and to some extend PayPal. 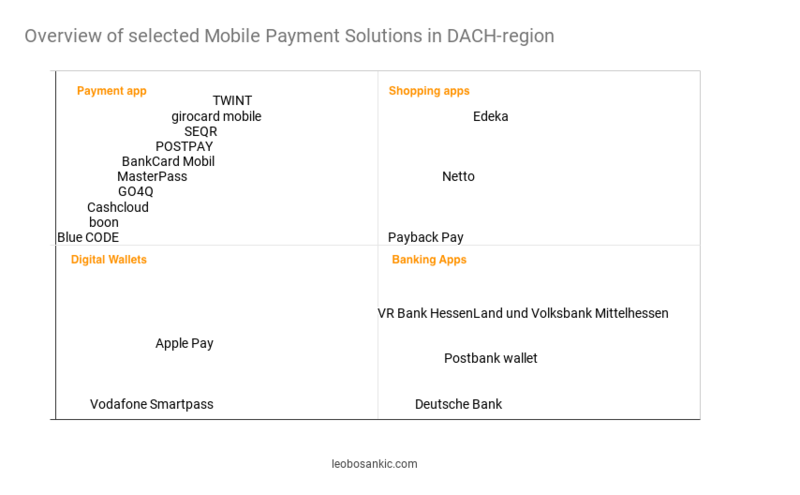 Whereas banks such as Deutsche Bank, Postbank, and now the VR Bank HessenLand und Volksbank Mittelhessen think that the primary application for mobile payments will be banking apps, I take the view that this should rather be digital wallets. If a new product is to replace an old one, the new one must be better than the old one. As mobile payment has always been a feature of the product “analog wallet”, the analog wallet is the old product and serves as the leveling board for the new product which is to support the feature “mobile payment“. Then, based on the above-listed primary payment products, digital wallets have the best chance to replace the analog wallet. Whereas digital wallets still cannot cover everything, there are indications that they could. Apple Pay or the Vodafone Wallet can store and utilize payment methods, several cards (e. g. club and loyalty cards) and tickets. Although none of these wallets can yet store receipts, Apple Pay has at least a transaction history. Admittedly, there are limitations in regards to IDs (especially driver’s license) and some cards but their absence is due to missing digitalization of those and not a digital wallet’s technical limitations. Furthermore, a digital wallet can become even greater because it enables things that aren’t possible (or at least not so comfortably) with analog ones. For instance, storing new “things” (e. g. Vodafone’s wallet can also be used as a key for Mercedes cars) or for the purchase of new things (with Vodafone’s wallet parking tickets can be purchased). Whereas purchasing parking tickets or virtual car keys is nothing new, their unification in one app is (especially if the wallet supports multiple ticketing systems). Furthermore, a digital wallet could be used for „payment optimization“. If a user has multiple payment methods (e. g. credit and debit cards, coupons, and loyalty cards) the wallet could automatically choose the most suitable payment method (e. g the ones with payback points), activate all coupons and collect loyalty bonuses. The other thing that speaks for digital wallets is that they combine all the features of the alternative primary payment applications. For instance, Apple Pay, by enabling integration of rewards cards, positions itself as a threat to shopping apps like PAYBACK. Furthermore, PayPal integrates rewards in form of discounts and thus competes with company-agnostic apps such as Netto’s. Finally, of course, they can be used for multi-channel payments as well. Noteworthy about a digital wallet’s multi-channel payment feature is that they support multiple payment methods (e. g. debit and credit cards from several banks, gift cards, coupons etc.). However, the strongest point can indeed be made for banking apps. On the one side, with banking services (e. g. remittances, checking transactions or opening banking products) they offer features which digital wallets do not have. On the other side, banking wallets enable things that are not possible on analog wallets, such as (purchase-based) up-selling. Consider N26 where it is relatively easy to get an overdraft facility (takes only a few minutes). If N26 saw a user running low on cash, it could offer an overdraft facility right from the app. Similarly, if revolut saw that a user made a larger purchase at an electronics shop, it could offer a suitable insurance right from the app. Nevertheless, digital wallets cover some of these features to some extent or could do so in the future. Apple’s P2P money transfer is one form of remittances and its transaction history equals balance checking in a very rudimentary form. Furthermore, banking services can as well be integrated into third-party apps as Personal Finance Managers (PFMs) show. Finally, however, the strongest point against banking apps is a trade-off between doing things that make sense strategically to the bank or to the customer. In contrast to digital wallets, the majority of banking apps allows only the banks’ own payment methods. The banks’ rationale behind these closed systems is understandable. By shutting out other payment providers they are prioritizing theirs and consequently increasing their revenues. However, from a customer point of view it is not understandable because there is a mismatch between customers’ payment behavior and banks’ strategies towards mobile payment. Whereas customers will accept a new product only if it is (significantly) better than the existing one, the strategies proposed by some incumbent banks lead to products that are not necessarily better. As talking about the replacement of cash would go far beyond this post, I will skip that and focus on replacing payment cards and replacing the wallet. Firstly, Deutsche Bank’s alleged smartphone wallet is not really a wallet because it supports only one payment method and cannot do anything wallet-related besides that. Furthermore, when viewing mobile payment as part of digital wallets, the banks who aim at replacing payment cards (see the German Volksbanken und Raiffeisenbanken  or the Austrian Erste Bank und Sparkassen ) are actually not improving the most important thing (the product, i. e. the wallet) but rather just one of its features (paying). To be precise, under the assumption that customers use other payment methods besides payment cards from one bank (e. g. gift cards or payment cards from other banks) the here mentioned banks might, in fact, be improving only a sub-feature instead of the whole thing (i. e. the feature “paying” is more than paying with payment cards from bank X ). In other words, whereas the customers’ payment behavior is paying with a wallet (with multiple payment methods), banks turn it into paying with payment cards from one specific bank. From the product-job perspective (“customers hire a product to do a job”) this “misplaced innovation” shows how the here mentioned banks define their customers’ job too narrowly. Instead of focusing on the whole customer job (paying), they focus only on one part of it (paying with one payment card). Finally, replacing NFC-based payment cards with virtual ones is a minor improvement as plastic payment cards function quite well compared to phones. They work on all devices (the banks’ apps are Android-only), all the time (no empty battery or broken screen), under all conditions (less prone to water) and are cheaper to replace. Their only advantage is the reduction of friction in regards to access. Whereas payment cards must be taken out of a wallet (and this wallet also out of somewhere), phones are already in our hands most of the time. Although this reduction of friction is, in general, significant, I think that the disadvantages stemming from smartphones and the innovation against payment behavior (one payment card instead of a wallet with multiple payment methods) outweigh it. However, a truly digital wallet would eliminate the last issue (innovation against payment behavior) and by being better than analog wallets additionally compensate for the smartphone-related problems. Y in english? Most of the readers should be germans?! I suppose they are, however, they speak English as well.